Learn the difference in many of the sizes of dishers in a short Tool Time video from Kitchen Conservatory: Disher video. Essential for every kitchen, dishers make cooking easier. 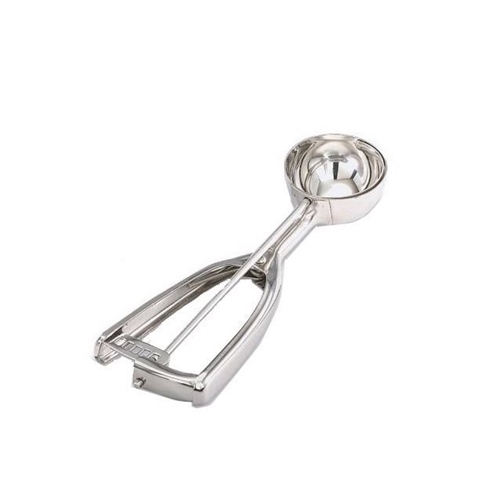 Use dishers for scooping chocolate truffles, cookie dough, portioning muffin batter, and, of course, scooping ice cream. The advantage is that each scoop is exactly the same size and shape so that the cookies bake evenly. The #100 disher is 3/8-ounce (3/4 tablespoon) and is the perfect size for chocolate truffles. 1 1/4-inch diameter. Dishwasher safe. Made of stainless steel.